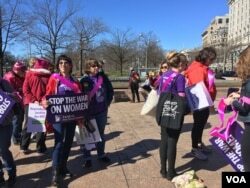 The group that organized January’s Women’s March in Washington have called for women to take the day off Wednesday to show their economic value. The event, dubbed by organizers as “A Day Without Women,” is meant to coincide with International Women’s Day, and to illustrate the economic power women hold by asking them to stay home from work and avoid spending money. The strike call marks the first major action taken by the group since January 21, when millions of people took to the streets in cities across the United States to protest the day after President Donald Trump was inaugurated. Trump took to Twitter Wednesday to voice support for the U.N.-recognized International Women’s Day celebration. He did not address the planned strike. Several public school districts in the U.S. will be forced to close classrooms Wednesday after teachers said they would skip school to participate in the strike. In North Carolina, Chapel Hill-Carrboro school district officials said the number of teacher and staff absences "was significant” and there would not be "enough staff to safely run our school district." 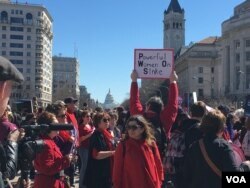 Karin Agness, founder of the conservative Network of Enlightened Women, said she thinks the strike is more of a media strategy than about actually advancing women. Egyptian women chant anti military ruling council slogans during a demonstration in front of the Journalist's Syndicate in Cairo, Egypt to mark International Women's Day, March 8, 2012.
International events Wednesday include an all-female kick boxing tournament in Toronto, Canada, a 10K fun run in Brisbane, Australia, that will see 10,000 women run through the city’s streets, and a literature festival in Dubai, United Arab Emirates, centered on gender equality. There are 22 female world leaders currently in power, more than any other time in history. Women currently make up about 44 percent of total employees at S&P 500 companies and hold 29 CEO positions at those companies, another record high, according to numbers compiled by Catalyst, a nonprofit group that promotes gender diversity. The 29 female CEOs represent just 5.8 percent of CEO positions at S&P 500 companies. “We make up over half the country, but right now we are less than 20 percent of Congress, that is not enough," Thomas said. "... when you don’t have a diverse governing body, you leave out entire swaths of the population through the policies that you enact." 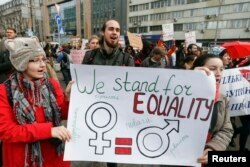 Demonstrators hold a placard during a rally for gender equality and against violence towards women on International Women's Day in Kyiv, Ukraine, March 8, 2017. Some data also shows women have made major gains in compensation, but their salaries still lag behind their male counterparts. Numbers from the Bureau of Labor Statistics show full-time female employees in 2015 made, on average, 81 percent of what their comparable male colleagues make. In 1979, women earned about 62 percent of what comparable male colleagues made. The BLS website adds the comparisons are broad and show "many factors that can be significant in explaining earnings differences, such as job skills and responsibilities, work experience, and specialization."